The U.S. Department of Agriculture recommends making dairy products -- a food group that also includes dairy alternatives, including soy or almond milk -- part of your daily diet. You need three servings daily, and a cup of vanilla soy milk contributes one-third toward your daily intake. Vanilla soy milk offers more flavor than plain soy milk, and you can find the Silk brand of vanilla soy milk at many grocery and convenience stores. 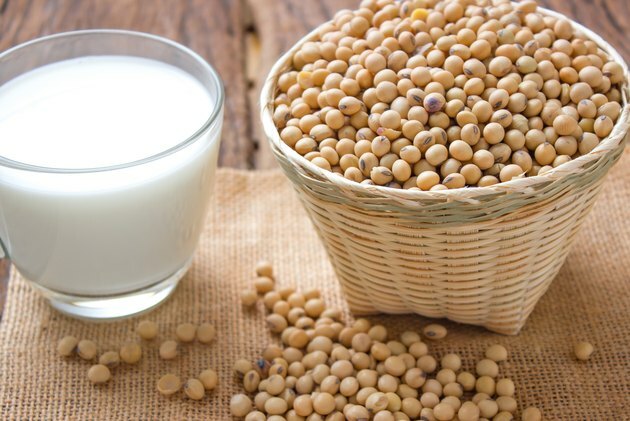 It offers significant amounts of several nutrients, making it worthwhile to include in your meal plans -- but it's not as healthy as some other varieties of Silk soy milk. Silk vanilla soy milk offers all three major macronutrients -- protein, carbohydrates and fat. Its 10 grams of carbohydrates and 6 grams of fat both provide energy you need for day-to-day functioning. Carbohydrates also help your body eliminate waste, while fat allows your body to better absorb vitamins. A cup of Silk vanilla soy milk also offers 6 grams of protein. Its protein content offers health benefits -- it helps maintain your hormone balance, activates enzymes essential for tissue function and helps your body build and maintain new tissue. Silk vanilla soy milk also offers health advantages because it boosts your intake of calcium and magnesium. These two nutrients combine to help make up hydroxyapatite, the substance found in bone tissue that provides bone density. Magnesium also facilitates chemical reactions needed to make fuel for your cells, while calcium helps govern cell behavior through its role in cell signaling. A cup of Silk vanilla soy milk offers 39 milligrams of magnesium and 299 milligrams of calcium. This contributes a significant amount toward your recommended daily mineral intake -- 320 milligrams or 420 milligrams of magnesium for women or men, respectively, and 1,000 milligrams of calcium for all adults. Incorporating Silk vanilla soy milk into your diet helps you consume more vitamin D. This complements the soy milk's calcium content because vitamin D helps your body absorb calcium and incorporate it into bone tissue. It also offers benefits independent of its effect on calcium -- for example, it supports healthy immune function. A serving of Silk vanilla soy milk contains 119 milligrams of vitamin D, or one-fifth of the vitamin D you should consume daily. The milk also provides a significant amount of vitamin B-12 -- 3 micrograms, or more than your body's daily B-12 needs. Vitamin B-12 not only controls gene activity -- a process important for fighting cancer growth -- it maintains nerve function and combats nerve damage. Opting for Silk vanilla soy milk over unsweetened soy milk has one major drawback -- its sugar content. Each serving of Silk vanilla soy milk contains 7 grams of sugar, compared to unsweetened soy milk's 1 gram per serving. This sugar increases vanilla soy milk's calorie content -- it contains 100 calories per serving, compared to 80 calories for unsweetened soy milk -- and also contributes to tooth decay and disease. For a vanilla soy milk alternative low in sugar, purchase unsweetened plain soy milk, and use vanilla extract to add vanilla flavor without adding sugar. USDA National Nutrient Database: How Much Food from the Dairy Group Is Needed Daily?